How to Check if a Website is Down? Surfing the Internet is somewhat easy as you first have to connect to the Internet through your ISP, run your favorite web browser software, type in the URL to the address bar and hit the Enter key to start loading the website. This is a user-friendly process as long as everything goes well but it could also become frustrating if one of your favorite websites that you frequently visit suddenly does not load while other websites work fine. In such frustrating situations, do not immediately come to the conclusion that the website is inaccessible for the moment. This negative scenario could have been created by other reasons: your DNS server is not resolving to the updated IP address, your computer is quietly blocking it through HOSTS file, or your Internet Service Provider could be blocking the website. The first step is to ensure that the website is entirely inaccessible by everyone and not just you alone. This can be logically confirmed by asking your relatives or friends if they are experiencing the same problem. Use a proxy server and try to access your website. A proxy functions like a remote computer that has a separate IP address from yours, hence, if your IP address is blocked, you can still access your website via a proxy IP. Use a virtual private network (VPN) to view your site. Use a website monitor capable of providing you with uptime status information of your website. If some of the above checks also prove that your website is down, then the problem is not from your end and hence it is a server issue. You will have to contact the hosting company's tech support, where your website is hosted, in order to investigate the problem. If it is a very serious issue, it may take a while for it to be fixed. At this point, you will just have to wait until the service is back. Poor quality in website hosting is one of the key contributors to website downtime. You will not know exactly how much downtime your website is experiencing because your hosting provider isn't likely to announce the amount of unplanned downtime your website encounters each month. This is the point where website monitoring comes into play. You will know exactly how much downtime your website is experiencing and whether or not it is time to look for a new hosting provider to get that downtime down to a sensible level. Hardware failure leads to more than 50% of all downtime for businesses. No matter how protected you think your hardware could be, there still exists a good chance that it will submit to failure at some point in the future and cause the whole website to go offline. A DDoS attack occurs when a group of people or a person floods a server with requests in order to overpower and crash the server. Even if your website is not the intended target, but a site that shares your website's server is, then your website is going to go down along with the targeted site as the attack takes place. Even a very small personal blog can be the victim of a DDoS attack if the targeted website sharing the server hosts the blog, hence, unless your website has a dedicated server, you could face downtime when your site becomes the victim of collateral damage if another website on your host's shared server is attacked by hackers. If your website has any weaknesses in security or has any penetrable breaches, a hacker will be able to find it and bring it down. Unlike DDoS attacks, where a few websites are just collateral damage because they are on a shared server that hosts the website that was the target of the attack, these hackers use bots that search for websites that have vulnerabilities and bring them down just because they have the potential to do so. This means that if your website is not built properly then it becomes vulnerable to the attacks of these hackers and these attacks can indeed cause serious bouts of website downtime for your online business. 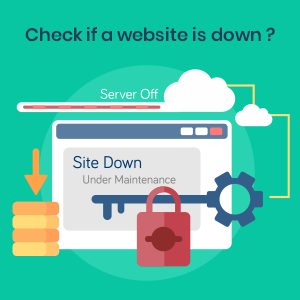 Regular maintenance of your website is very important because there are several things that could lead to downtime if your website is left unchecked. If you are not alert in guaranteeing that everything is working properly on a periodic basis, your website could experience a catastrophic failure followed by a prolonged period of website downtime. DNS issues are another key reason for website downtime. Even a simple misspelling of a nameserver can cause your website to go down. There are times when the DNS issues could get more complicated. If DNS issues are the reason your website fails to load, you need to understand what the culprit is and what you actually need to do in order to correct it as soon as possible. No matter what type of content management system (CMS) your website could be built on, it could experience issues related to on-site software which can lead to inevitable downtime. There are chances for someone to install incompatible plug-ins on a WordPress site, for instance, bringing a complete website down. Database errors and several other internal conflicts can also make your site to load completely blank pages, partial pages, or just not load at all. If downtime seems to be unavoidable, you will be able to protect your website's profits by thinking of practical measures that will help reduce downtime as much as humanly possible. Adopting a good and efficient website monitoring service will thus be of immense help as it will notify you of problems before they lead to complete downtime. This website monitoring service will also let you know the moment your website does go down, allowing you to get to work as soon as possible in order to get your website back up and running again. Comodo, a cybersecurity company, has developed cWatch Web – a website monitoring service that keeps your website safe and secure, while constantly working to mitigate new threats and harden defenses. You get Comodo's team of certified security analysts to watch over your website. The CSOC is made up of real humans who are skilled certified security analysts capable of leveraging Comodo's modern technology to watch over your website, systems, applications, and intervene at any sign of a threat to rapidly remediate accordingly. cWatch Web's Security Information and Event Management (SIEM) provides 24/7 real-time security monitoring, cutting-edge threat detection, cyber forensics, and instant incident management. A global system of distributed servers to enhance the performance of websites and web applications. This WAF analyzes, detects, blocks and filters bad traffic in real-time with cWatch Web. Powerful, real-time edge protection for websites and web applications providing advanced filtering, security and intrusion protection. This scanning enables merchants and service providers to stay in compliance with the Payment Card Industry Data Security Standard (PCI DSS). It ensures that payment cardholder information is protected from possible security breaches via a meticulous network and application scans to detect and fix security vulnerabilities. If your website is hit with a DDoS attack, Comodo cWatch Web will know about it before you do. cWatch's CSOC monitors your website 24/7 and the SIEM team will plunge into action to prevent the attack, even before providing you with a highly-detailed post-event forensic report. Automatic monitoring and removal systems work in tandem with the humans inside the CSOC to make up the Comodo cWatch Web security stack that provides a comprehensive 24/7 anti-malware service capable of analyzing websites for malicious content and completely eliminating all threats when necessary. This web security feature detects malware, provides the methods and tools to remove it, and prevents future malware attacks.